Bristol Rovers have been reported to the Football Association after pitch invasions occurred during Saturday's 2-1 win at Wycombe. Away fans poured onto the Adams Park pitch following David Clarkson's second-half winner and crowds came on again at the final whistle. Rovers have confirmed their safety officer will study CCTV footage in an effort to identify offenders. The club have said they could be punished with a "hefty fine or worse". A statement on the Pirates' website read: "It is worth re-emphasising that encroachment onto the playing area is a criminal offence and any supporters identified from last Saturday could be subject to a club ban from the start of next season." 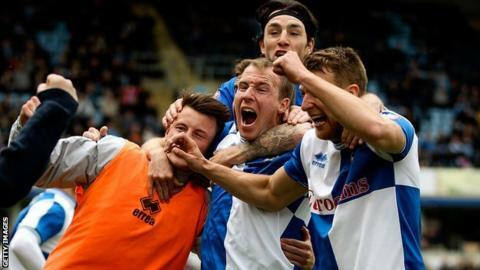 Saturday's result meant Wycombe dropped into the relegation zone, while Rovers moved three points clear of danger. Darrell Clarke's side play their final game of the season at home to Mansfield this weekend, and need a draw to avoid dropping out of the Football League.